It is estimated that Balochi speakers are more than 20 million and most of them reside in Pakistani Balochistan, Iranian Balochistan, and Afghanistan and other parts of the Asia and Europe. They have got different dialects of Balochi speaking living in different areas with sheer assimilation of Balochi culture, traditions, strong devotion and love for Balochi. There are mainly three dialects of Balochi language: Makurani, Rakhshani, and Koh-e-Sulemani.Balochi, one of the oldest languages, has got a vague history like such other languages. 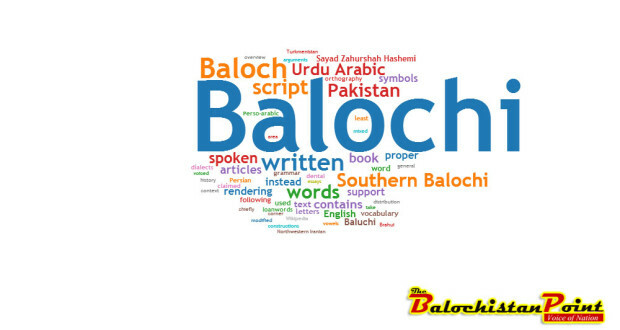 The views, Baloch and west scholars share regarding its origin, are yet controversial and unclear; however, we cannot wholly claim that the origin of Balochi language is unclear rather there are some satisfying answers to it. Some of them state, it got originated in Persian, and some relate its origin to Iranian group of the Indo-European language family. Anyhow, the language today we speak is a very rich language: full of vocabularies, idioms and idiomatic phrases, lullabies, folk stories, folk songs, and folk literature. It is also full of writers, poets, researchers, and linguists. Before 19th century, Balochi was an unwritten language. The reason was that there were not any literary people and linguists in Baloch community till mid-19th century. However, there have been a lot of literary works in Balochi language from 1950s onward. As Sayad believed, the mid-19th period and twentieth century were renaissance of Balochi language. It has become an article of faith that Balochi has originated in Iranian group of the Indo-European language family before some three thousand years and is older than Persian and other neighboring languages. The Indo-European language family has originated from Aryan language, one of the basic languages of ancient people. Lastly, it would be a step in the right direction if we pledge to struggle to fulfill all the essential requirements of our language and work harder to enrich it with more and more literary works and writings, since Balochi is the future of Baloch.